MALACCA, 13 Dec. 2010 – University education now needed to prepare students to be innovative while encouraging them to have the entrepreneurial wherewithal to enable them to face more onerous challenges once they graduated. Thus graduates needed to have a paradigm shift from merely looking for jobs to becoming entrepreneurs starting their own businesses, said UKM Vice Chancellor, Prof Tan Sri Dato’ Dr Sharifah Hapsah Syed Hasan Shahabudin. 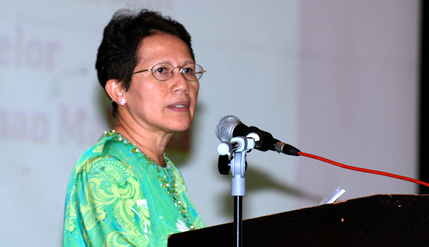 Giving her keynote address at the Teaching and Learning Congress organised by UKM’s Centre for Academic Advancement here today, she said such innovation would be in consonant with national development efforts based on the new economic model which encourages societal transformation and business development through new and innovative products and services for higher income creation. In facing those challenges, Prof Sharifah Hapsah said, the university needed to provide relevant quality education while providing the direction to promote and upgrade research activities to be more innovative for commercialisation. To ensure those activities can meet the desired results, the university needed to have quality administration, an effective leadership and competent management of talents. Looking at the education component, the unversity also needed to be able to produce knowledge based human resource that can meet the new economic needs. Such human resource needed to be innovative in creating new products or at least improving on the existing ones through what they have acquired while at the university. Thus emphasis needed to given to post graduate studies as its major concern in the new economic era where students will be more involved in R&D for wealth creation from their research activities. In order to meet the infrastructure needs and to encourage such culture, UKM has already set up the Collaborative Innovation Centre and the Centre for SME Development (CESMED) responsible for coming up with programmes as well as supervising start up companies while working out the rewards and incentives to be given as well as creating the networks to support innovations and entrepreneurship in UKM.